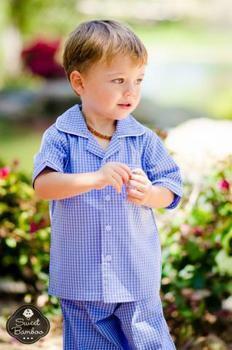 Sweet Bamboo of Carlsbad, Calif., is recalling about 500 sets of children’s pajamas. The garments fail to meet the federal flammability standards for children’s sleepwear, posing a risk of burn injuries to children. This recall involves children’s 50% polyester and 50% viscose from bamboo, woven two-piece, short-sleeve shirt and pant pajama sets. They were sold in four colors: dark blue gingham, light blue gingham, purple gingham and black pin dot. The pajamas tops have white buttons down the front and the bottoms have an elastic waistband, and were sold in sizes 12 to 18 months, 18 to 24 months, 2T, 3T, 4T, 5 and 6 years. The pajamas, manufactured in China, were sold at children’s boutique stores nationwide and online at www.mysweetbamboo.com from February 2016, through May 2017, for about $40. Consumers should immediately take the recalled pajamas away from children and contact Sweet Bamboo for a full refund. Consumers may contact Sweet Bamboo toll-free at 888-408-2822 from 10 a.m. to 4 p.m. (PT), Monday through Friday or online at www.mysweetbamboo.com and click on “Product Recall” at the bottom of the page for more information.